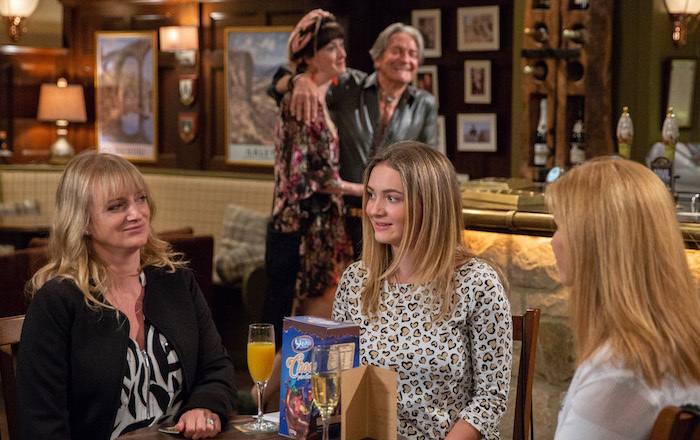 Emmerdale Spoilers: The Emmerdale Big Night Out – Part One Revealed! 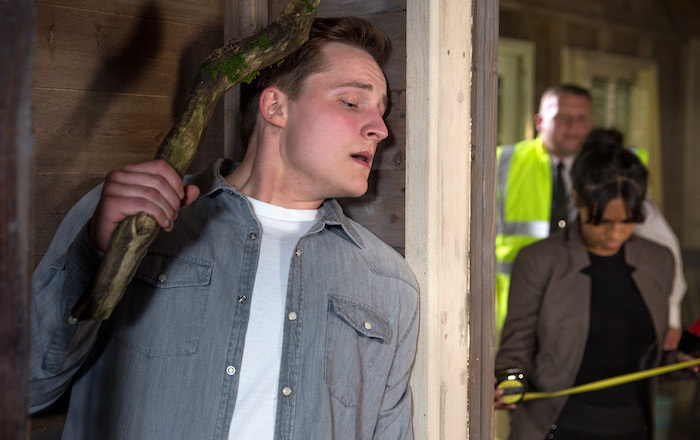 Emmerdale Spoilers: Rhona and Pete in trouble? 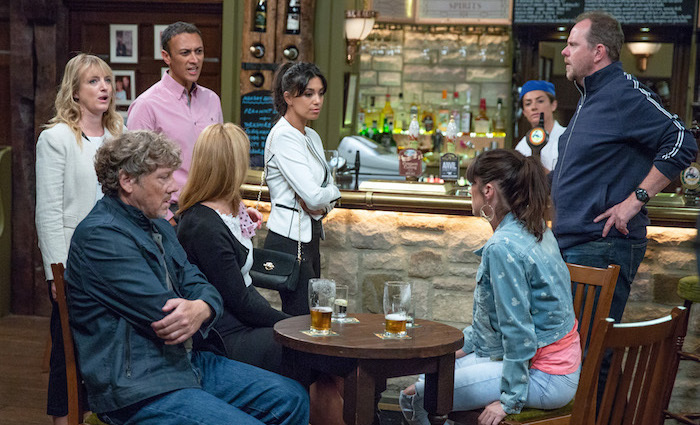 Emmerdale Spoilers: Tracy and David kiss on Big Night Out! 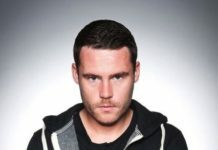 Emmerdale Spoilers: Will Billy Fletcher return to a life of crime? 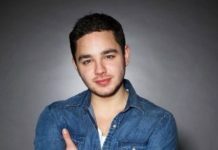 EMMERDALE EPISODES: Kerry Wyatt is accused when money goes missing, Pete tries to befriend Leo, and Victoria drops Matty in it with his girlfriend but is it intentional? 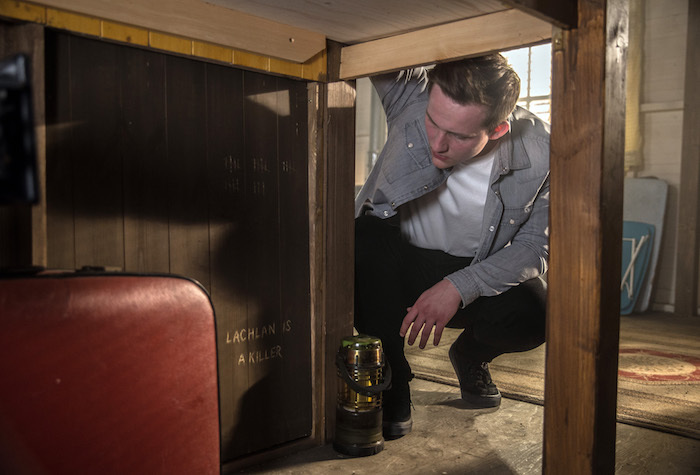 Lachlan is nervous when Priya says she’s got patrols on the old clamping site and finds a message from Rebecca. 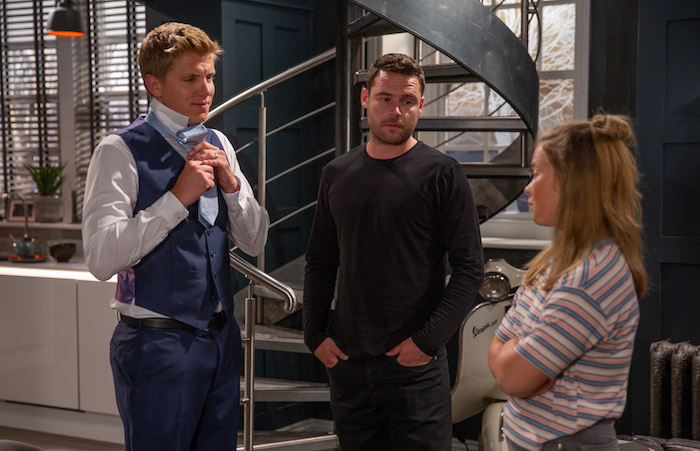 Lydia gets news from the hospital and sees a face from the past, Misty has plans for her and Rodney, and Robron forget an important date for Liv. Mon 20 Aug 2018: Nicola King is alarmed to see the factory’s money is missing from her bag. 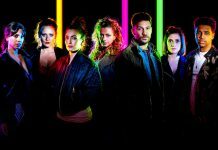 Mon 20 Aug 2018: Nicola King’s left seething believing Kerry Wyatt is the culprit. Soon Nicola and Jai Sharma confront Kerry about stealing the cash. 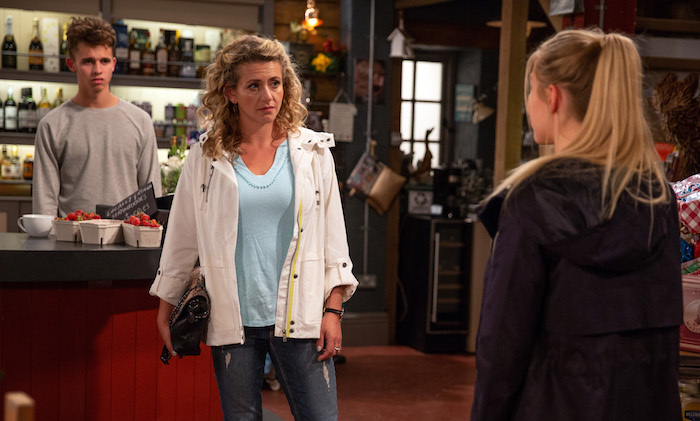 Mon 20 Aug 2018: Kerry Wyatt insists she didn’t take the money but will Nicola King and Jai Sharma believe her? 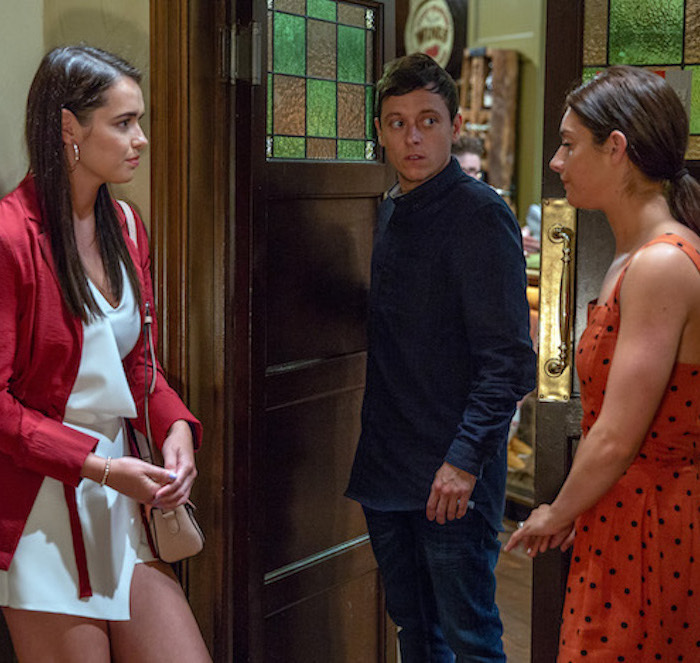 Mon 20 Aug 2018: Matty Barton admits he’s scared to tell Abby he’s trans and Victoria Barton chuffed when he asks her to spend his birthday with him. 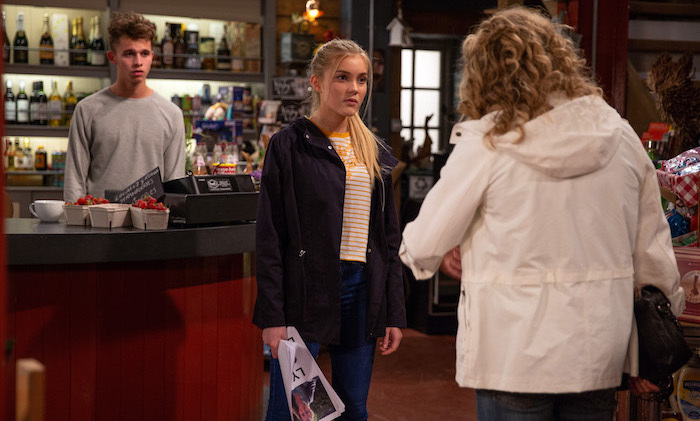 Mon 20 Aug 2018: Matty Barton gets a text from Abby wanting to meet up the next day. 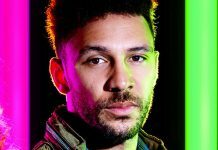 What does that mean for his plans with Victoria Barton? 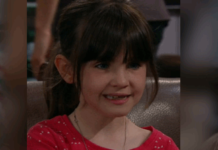 Tues 21 Aug 2018: When Victoria Barton finds Abby crying she assumes Matty Barton told her about his transition. 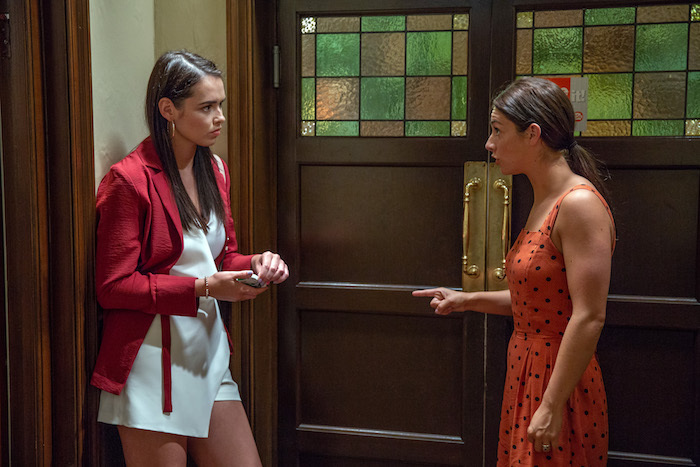 Tues 21 Aug 2018: Victoria Barton lashes out at Abby for not understanding what Matty Barton is going through. 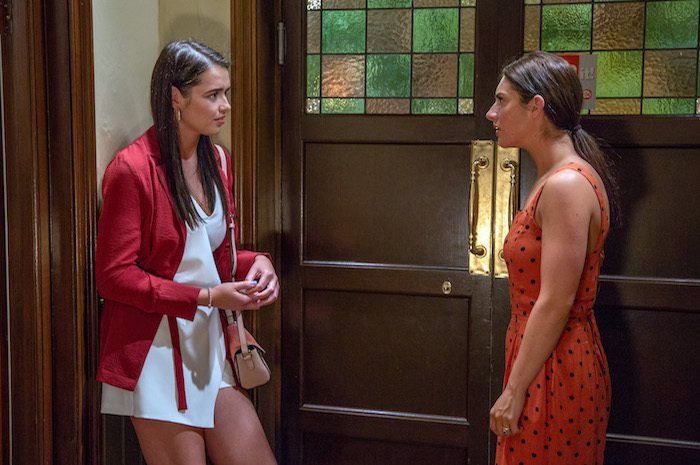 Tues 21 Aug 2018: Victoria Barton is mortified when she realises Abby didn’t know about Matty Barton after all. 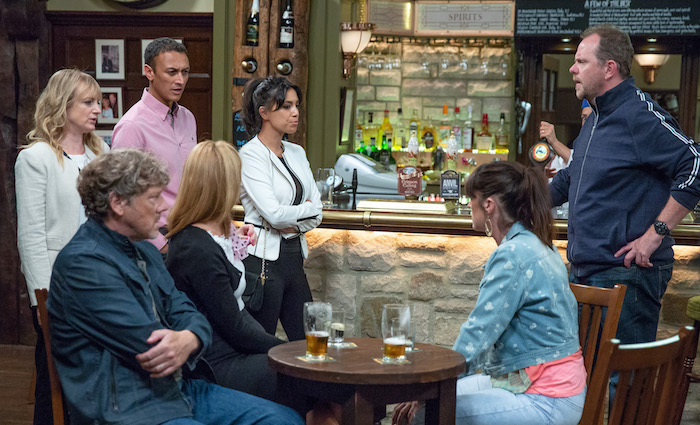 Tues 21 Aug 2018: Matty Barton is devastated that his secret is revealed. 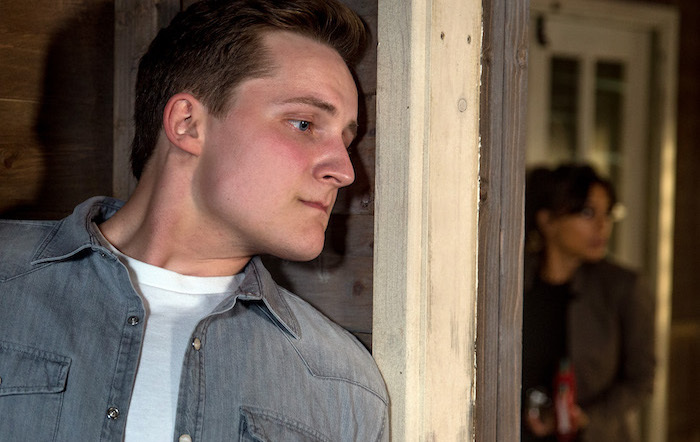 Will he be able to forgive Victoria Barton? 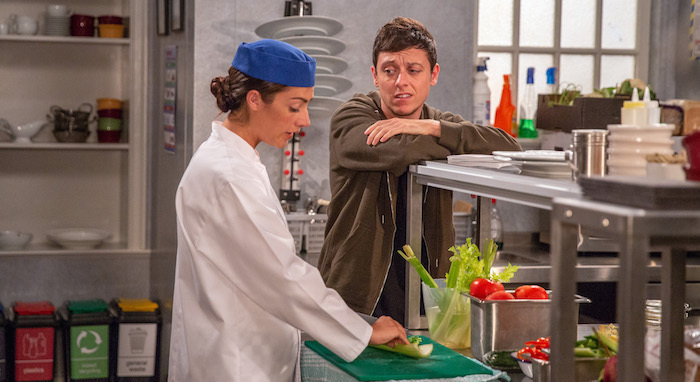 Tues 21 Aug 2018: Leo’s disinterested when Rhona Goskirk explains Pete Barton is moving in. 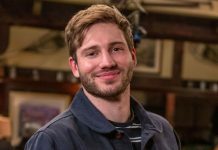 Tues 21 Aug 2018: Can Ross Barton use his paternal skills to help Pete to get Leo on side? Tues 21 Aug 2018: Doesn’t look like Leo is that impressed with Pete or Ross Barton. Wed 22 Aug 2018: Jacob Gallagher is thrown when Leanna Cavanagh pulls out a pile of homemade leaflets branding Maya Cavanagh a gold digger. 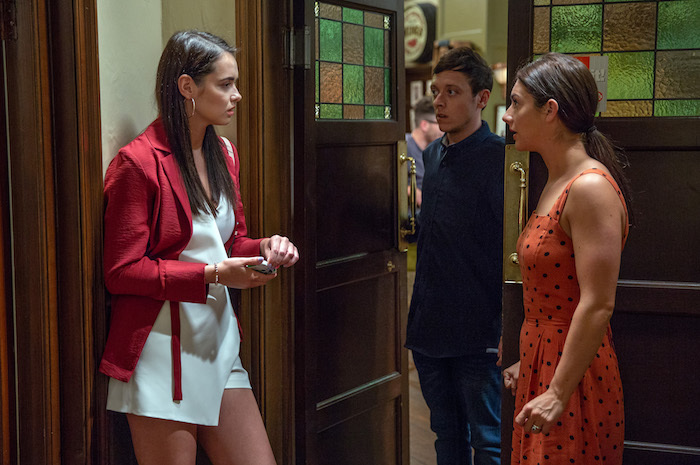 Wed 22 Aug 2018: Jacob Gallagher insists that he’s not getting involved with Leanne’s plan but later, a furious Maya confronts Leanna about posting accusations on social media. Wed 22 Aug 2018: Leanna Cavanagh shows mum Maya one of the leaflets and implicates Jacob Gallagher. Wed 22 Aug 2018: Leanna Cavanagh storms out and Jacob Gallagher’s left with an upset Maya. 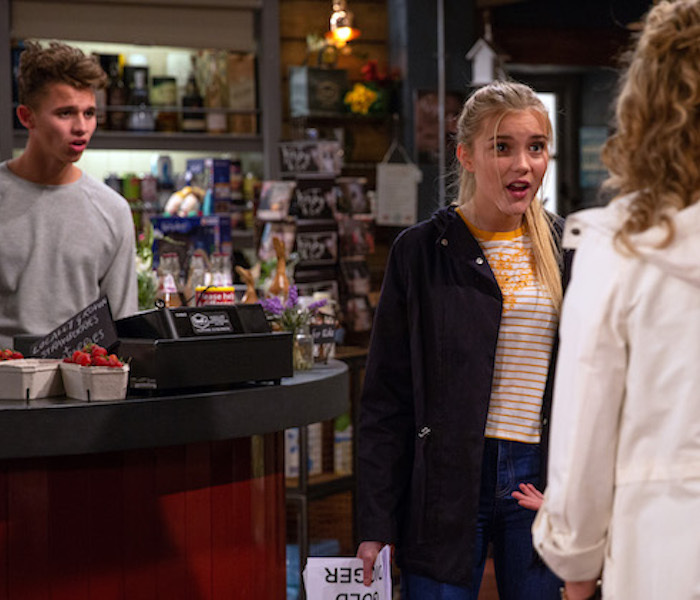 What will Maya say and how will Jacob react? Wed 22 Aug 2018: Belle Dingle and Lachlan White are excited after putting an offer in on a house until Priya Sharma mentions she’s hired a dog patrol for the glamping site. 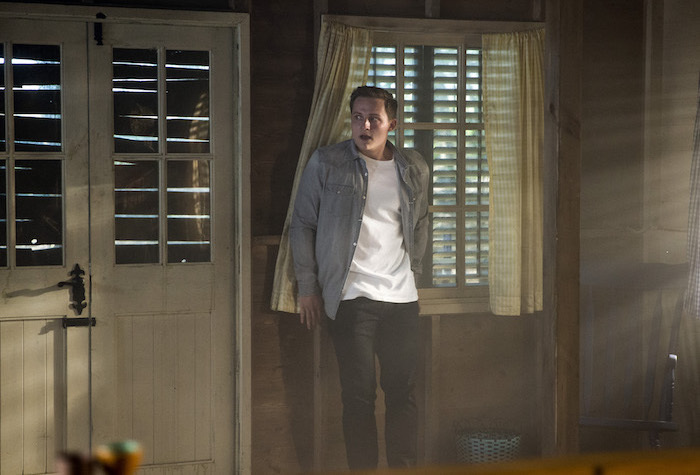 Wed 22 Aug 2018: Worried Lachlan White sneaks through the woods and watches the security guard walk away before heading towards the cabin he held Rebecca in. 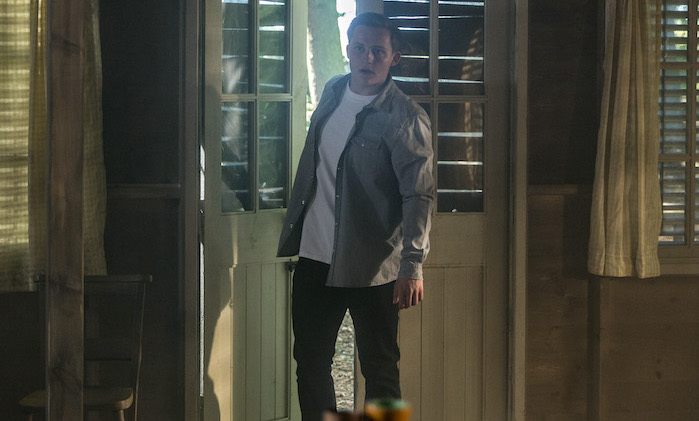 Wed 22 Aug 2018: Inside, Lachlan White notices the message Rebecca wrote about him and tries to erase the words. 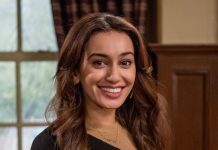 Wed 22 Aug 2018: Lachlan White is nervous as Priya Sharma and the dog patrol are outside of the cabin. 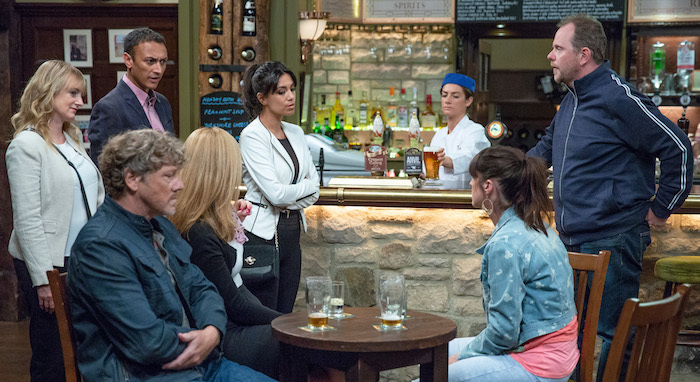 Wed 22 Aug 2018: Lachlan White tries to erase the words but is interrupted by Priya Sharma’s arrival. Wed 22 Aug 2018: Will Priya Sharma see the writing on the wall and if so what will Lachlan White do? Thurs 23 Aug 2018 – 7pm: Lydia Hart is grateful for Sam Dingle’s support as she gets her test results. 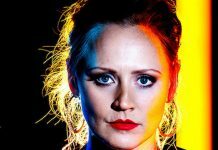 Thurs 23 Aug 2018 – 7pm: Lydia Hart comes face to face with Pat, a woman from her past. Thurs 23 Aug 2018 – 7pm: As Lydia Hart storms past her and ushers Sam Dingle out, a baffled Sam is left wondering who Pam is. Thurs 23 Aug 2018 – 8pm: Misty reveals she has been offered a fire eating job in Thailand for a year. 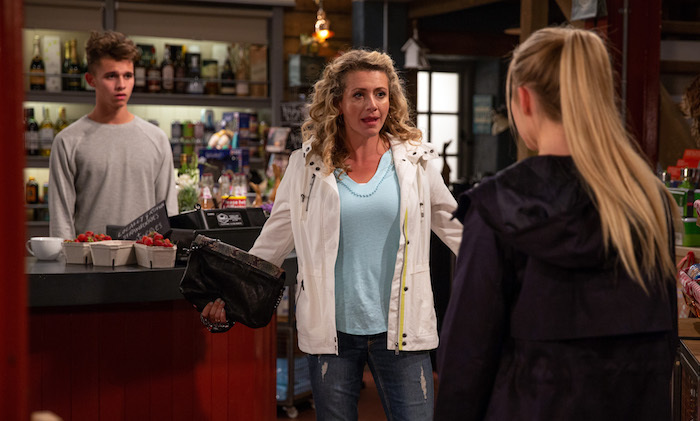 Thurs 23 Aug 2018 – 8pm: Nicola King is horrified when Misty declares Rodney Blackstock is accompanying her to Thailand. 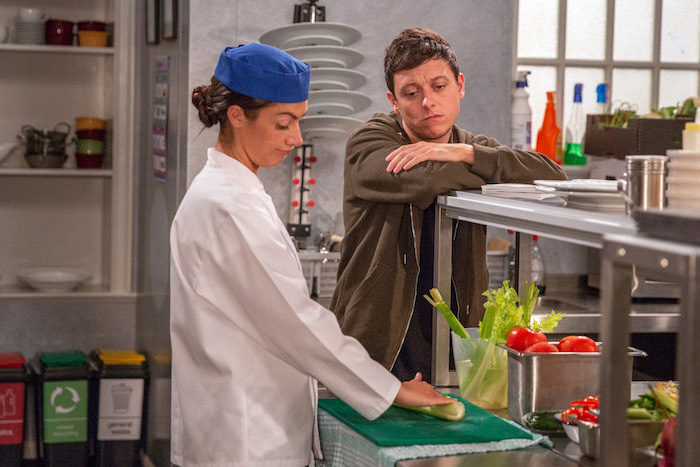 Thurs 23 Aug 2018 – 8pm: Aaron Dingle and Robert Sugden are mortified to realise they have forgotten about Liv’s exam results. 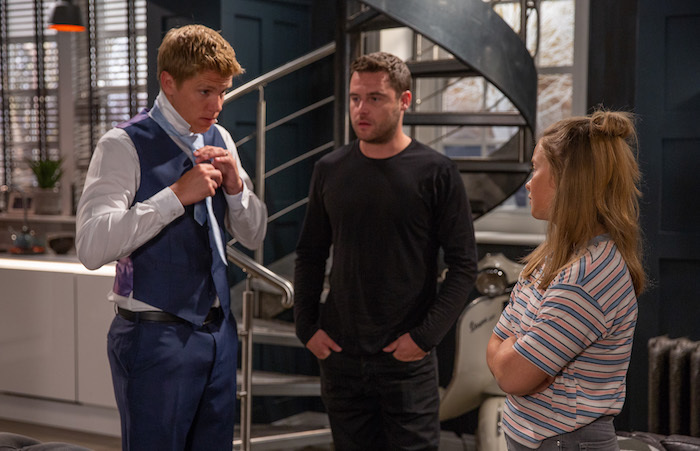 Thurs 23 Aug 2018 – 8pm: Seriously, Robron need to get a calendar as this is not the first time they’ve forgotten an important date for Liv Flaherty. Thurs 23 Aug 2018 – 8pm: Rhona Goskirk receives her decree absolute and Jessie jokes she and Pete Barton will be getting married soon. 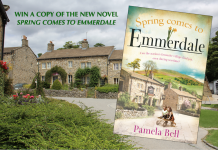 Emmerdale is on ITV at 7pm Monday to Friday, with an additional episode at Thursday’s at 8pm. 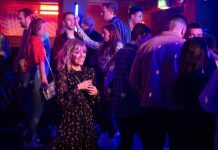 The Emmerdaily is a fan website talking all things Emmerdale...we may even throw in the odd spoiler from Betty ;) - sign up to our newsletter for events and news updates.